WEAPONS- A bamboo stick that she uses as her flying broom, she also uses the split ends to cut and slash at her enemies. NATURAL ABILITIES- Gallidaysay has a mix of fighting styles that she likes to use to throw off her adversaries, leaving them guessing what she is going to do next. She loves Kung Fu. she is very flexable and agile. MAGICAL ABILITIES- Gallidaysay uses her magic to conger creatures, and morf her bamboo staff in to other weapons, but it stays the same color. She is not able to conger firing weapons such as guns. She can use her magic to make her weapons and or herself stronger and faster, when she chants her spells properly, but from time to time she is so caught up in her fights, that she is unable to remember the spells properly. In order for her to do any spells, she must chant the spells words. you can make them what ever you want. 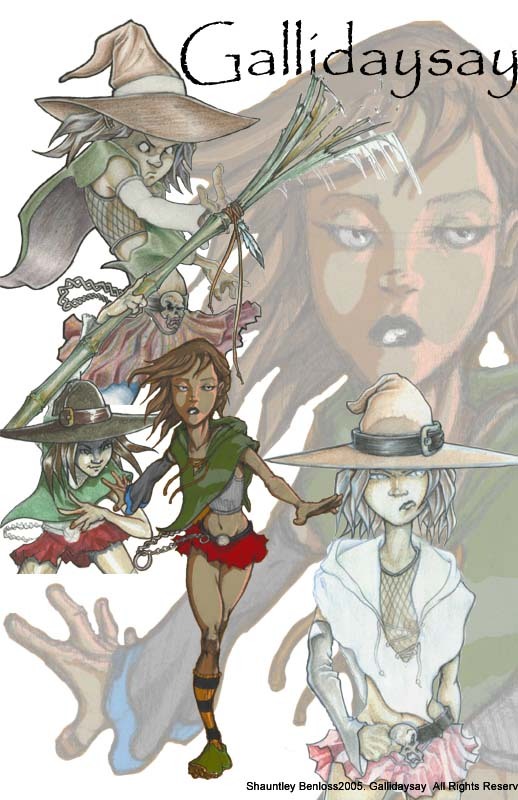 Gallidaysay is a small 17 year old witch, that was thrown from the safe house of her creator's imagination, and scanned into his computer. droping her in void city, to take part in a larger death tournament. She is also ment to go on a special mission if she is able to survive entry into the hell that is Void. Gallidaysay dosent remember much about herself yet, but as she gets closer to her goal, the more the is able to recall about herself and her former home. All she knows from the moment she landed in void is that, she has to get through what ever is in her way no questions asked. she enjoys playing inoccent but she is far from it. her skull belt buckle talks to her. taunting her, trying to make her believe that she will fail at her mission. She is a tormented child. almost broken, but she fronts like she is hard as nails very well.